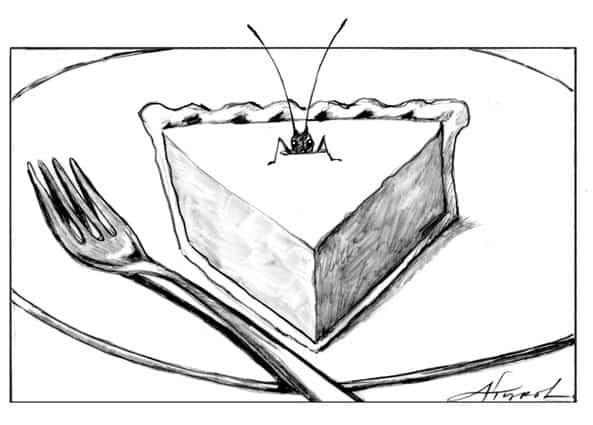 Home > Column > Pass the pie…and crickets? As you put together a dinner plan for this Thanksgiving, perhaps you’re looking for something to add a little variety to the traditional holiday meal, or ways to eat healthy food while supporting good environmental practices. How about adding insects to the menu? Along with crackers and cheese, grasshopper fritters make excellent appetizers. Or consider adding sautéed crickets and greens as a side to your potatoes, turkey, and gravy. What about cricket flour fruitcake instead of the typical pumpkin pie? Like the majority of North Americans, you probably cringe at the thought of insects for dinner. Yet people in many cultures eat insects. And many of the insects they think are delicious are familiar in the Northeast. We usually see crickets and grasshoppers in fields, but many people around the world think they look good served on a skewer. They were eaten by Native Americans, including the Ute and Shoshone people from the southwest. In the Great Basin (covering Nevada and Utah) crickets, locusts, and grasshoppers would congregate at certain times of the year in huge numbers, making them easy to catch and roast. Crickets here in the Northeast aren’t so easy to catch, but they’re just as edible. Mealworms, which originated in Europe and can now be found in temperate regions everywhere, are also popular as snacks, and why not? Apparently, after being salted and fried, they rival potato chips in crunchy deliciousness. Not sure what to do when millions of cicadas come out every 13 or 17 years? You can eat them; they’re considered a delicacy in Shanghai. Or there are the mobs of June bugs that show up every May and June. Next summer, try roasting them until they pop; add salt and you have a crunchy popcorn-like snack. In our region, entomophagy – the practice of eating insects – has been gaining attention due to the efforts of formerly Vermont-based environmentalist Rachael Young. As the founder of Eat Yummy Bugs, Rachael arranged events across the state, often in collaboration with local chefs or even chocolatiers, from Nutty Steph’s chocolate shop in Middlesex to PsycheDelicatessen of Burlington. Insects are a tasty, nutritious, and healthy source of protein. As an example, a 100 gram serving of ground cricket is just 121 calories, with 13 grams of protein, only 5.5 grams of fat, and includes many vitamins and minerals, including calcium and iron. An equal portion of ground beef is 288 calories, with 23.5 grams of protein and a whopping 21 grams of fat. Yet what is really turning heads these days about entomophagy are the environmental benefits. Rearing birds or mammals for meat is a resource-expensive way to make food. Consider this: 2.5 pounds of feed is needed to make just one pound of poultry, but only 1.7 pounds of feed will get you a pound of cricket. Better yet, nearly the whole cricket can be eaten (it’s preferable to remove their legs, which are spikey), whereas your holiday turkey has many inedible bits including feathers and bones. Insects may be the easiest of all animals to raise. They need very little space, food, light, or water. They can be raised at high densities with little environmental impact, unlike large-scale commercial poultry, pork or beef farming. Insect farming hasn’t really caught on in North America, although it’s gaining momentum. The two most prominent sources of commercial crickets, World Entomophagy and Aspire Food Group, merged this summer to take cricket farming and entomophagy education to a whole new level. Or, if you prefer to eat local, try raising insects at home. Crickets require so little space you can keep them in a closet. A covered aquarium with some soil (where they lay eggs), an egg carton to climb on, wet cotton balls for water, and food scraps are all you need to be a cricket farmer. Mealworms are even easier to raise and will spare you the chirping. They’re perfectly happy with a container of oats and leftover veggie scraps. This Thanksgiving, as you admire your traditional spread of roasted turkey, potatoes mashed with cream and butter, and rich gravy, followed by a big slice of pumpkin pie, consider how a few six legged ingredients might round out a classic meal.